Commenting is one of the most important parts of blogging. it’s what makes blogging a conversation. Now Blogger has introduced 2 new improvements to Blogger’s comments system: Spam filtering(Spam Inbox) and the ability to view all comments on your blog in one place(Comments Inbox). The Published sub-tab(under Comments tab) provides a similar view as your email inbox. You can see all of the comments on your blog in one place. Also you can mark them as "spam",delete or remove content of the comments.When you mark a comment as Spam, it will be deleted immediately from your blog. To fight with spam, some of you enabled moderation of all comments or required word verification or login. While somewhat effective, these checks limit real-time conversations around your blog.To address this,Blogger have integrated Google’s spam filtering technologies into the Blogger comment system. 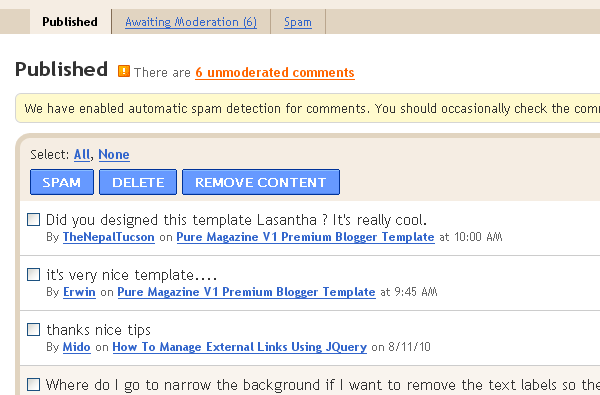 The comments in the Spam inbox are not visible to your readers. Here, you can permanently delete spam comments by selecting them and choosing Delete. You can also mark comments as Not Spam that have been incorrectly classified as spam.Choose Not Spam and the selected comments will be moved out of the spam list and will be immediately published on your blog.